I believe an antique is defined as something that has lasted over 25 years... in this case, this photo is approximately 40 years old. This photo was sent to me by my mom. It shows me, my sister, my mom, my dad, my grandmother and my great grandmother. Definitely in the summer and look at my mom's hair... (far right) definitely 60s! Great photo, Terri. 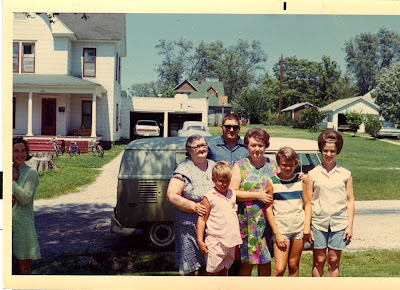 My hairstyle was similar to your mother's, back then and my sister owned a VW Bus! Is it me or Ashley resemble your mom? I love old photos! Especially those of my great great grandparents. It's funny that back in the 1800's people didn't smile for photos. Isn't it fun to look back at old photos?! I think so. I love photos. Every moment to be is a "kodak" moment. Seriously though your pic is so cute..what memories it stirs, I imagine! I LOVE old photo's. I was at a thrift store today and they had a whole basketfull. How do people just dump their pictures? Cute. I love the hairdo. Look at those short shorts too!!! It's hard to believe life moves so fast! Hi Terri, I had to smile when I saw your antique photo. My granddaughter had all four wisdom teeth removed on Monday and I had her with me all day. We spent several hours this morning looking through literally hundreds of really old family photos. It was so enjoyable and I was able to share so much with her ... though I think pain meds might have made her a little woozy and I don't know how much she will remember tomorrow.